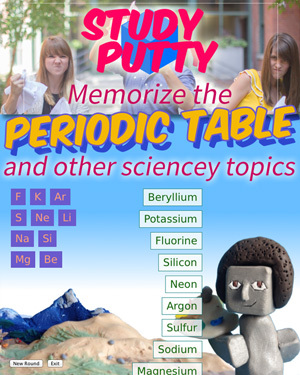 Visit our project StudyPutty.com to use our awesome memorization tools. It’s free and it’s a change of pace from quizzing yourself on that crumpled-up cheat sheet for the twenty billionth time, for the love of Gallium. Click the logo below to go there now! Here in the Study Putty division of Learning-Laboratory, we firmly believe in limiting drudgery to the bare passable minimum. That’s why we offer 15 games and growing on the chemical elements, to get the job done and over-with. There are games for memorizing the symbols and atomic numbers of only the first twenty elements, and there are games for memorizing the symbols and numbers of the whole darned thing–if you think you’re a pro like that. And, there are various sets of elements in between for you to study. Whatever you need to get by, my friend. You know you want to try it, you egoist: Prove you know all 118 elements by their atomic numbers. No looking, cheater. For the discerning beginner, we offer simple, nearly painless tools for beating the symbols of the elements into your skull. Sometimes brute force gets the job done, so come bang your head against the data until it sticks. Whereas in your textbook or handouts it is drab data, here it is colorful, cheery data to bang your head against. It will be so much easier to do your chemistry homework problems when you don’t have to stop to look up which elements or chemicals the problem is talking about every time. Is Ra Radon or Radium? Not sure? Better get in here. Is Al Aluminum or Aluminium? Answer: Yes. Yes but not Si. That’s Silicon. To each element, a number. Well, several numbers, but first and foremost, the atomic number, or the number of protons in the nucleus of the atom. Need to know ’em? Let’s practice. Count with me now. One little two little three little Indiums. Actually Indium has an atomic number of forty-nine. If you need to know that for a quiz, we got your back. Is Astatine metal or nonmetal? How about Antimony? Is Judas Priest metal? You bet your [At] it is. \m/ For the more advanced student, we can move on to classifying alkalies, alkaline earth metals, noble gases, poor metals, and the like. Need to know it for class? We’re here to help. What’s that? We don’t have what you’re looking for? Tell us what you need to cram via support@sherprog.com and we’ll try our best to help you out. 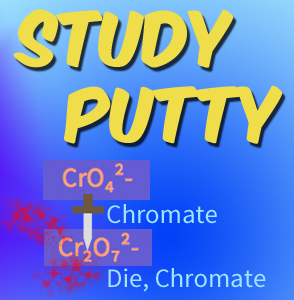 Study Putty is in public beta and loves to hear feedback and suggestions. Check out our other Chemistry activities too! 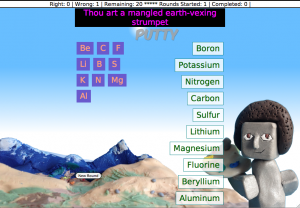 Tagged activity, Chemistry, classroom technology, e-learning, educator resources, learning activities, Learning Technology, online learning, periodic table, Science. Bookmark the permalink.